Want to learn how to fight like a Navy SEAL? The Scientific Combat Reactionary System (SCARS) is the official hand-to-weapon fighting system of the United States Navy SEAL Teams. SCARS is now declassified and out on tape. It's also being taught by its creator, Jerry Peterson, to a limited number of civilians, on a once-in-a-blue-moon basis. Groundfighting practice at the SCARS Institute includes an often neglected element: weapons. I am proud to be the first journalist ever invited to undergo SCARS training. Going in, I was more than a little curious about a contemporary combat style which uses no blocks whatsoever and consists of nothing but finishing shots. A style which the Navy admirals consider to be unbeatable. How tough is SCARS? Our camp had already lost two guys by lunchtime on the first day. One man broke his wrist. He wasn't used to being thrown, especially by someone who wasn't used to throwing. But the second camper quit outright, despite having paid $5,000 to be there. He just couldn't stomach the brutality. Welcome to the world's most expensive self defense training. New, greener Phoenix, Arizona was still hot and dry last October at our 40-Hour Spec Op/SEAL Platoon Work-Up Camp. Those in attendance were paying bargain rates to study with millionaire shadow-ops guru Jerry Peterson, a.k.a. "The Deadliest Man Alive". $5,000 and traveling expenses--a bargain? Yes, since Peterson earns up to $1,700 an hour. Thirty-two men in their twenties to their sixties converged on Phoenix's SCARS Institute of Combat Sciences. They were not SEAL wannabes in camo pants who could only talk about their knives. On the contrary, our campers personified Guy America: skinny and large, short and tall, white, yellow, black and brown. Among us was a retired Fortune 50 CEO, himself a distinguished veteran of both the Army Delta Force and the Marines. Equally present was a plain-spoken young dude from Kansas who claimed to "just own some trucks". There was a polite Indian businessman who confessed to feeling so out of character that he had told his office staff white lies about the "subject" of this Phoenix "seminar". And we also had a sawed-off monosyllabic Arizona SWAT team leader with sniper's eyes and memorably hard fists. Aside from an enviable amount of disposable income, all the campers shared one crucial distinction. Each of us had been exposed to the most successful video self defense course in marketing history--Jerry Peterson's SCARS tapes. These 1993 training tapes came out of that covert nowhere where spies work. They were advertised in only four limited-circulation national magazines. Yet Peterson's course went on to gross one million dollars in only its first nine months on the market. Business analysts were bedazzled. There's one excellent reason why the original SCARS tapes made so much money worldwide. They were breath-takingly pricey--the single most expensive set of self defense videos ever put out. Yet they undoubtedly rank among the least expensive to produce. They were made in one take, virtually overnight, for next to nothing, by shortcuts which video pros kept solemnly assuring the SCARS people could never possibly succeed. We October campers were bedded down at comfortable motels and picked up at 6:45 a.m. each morning for a short mini-van drive to the Institute. Seen by early sunlight, the 20,000 sq. ft. SCARS Institute's contemporary western architecture recalls an Old West adobe monastery. A Shaolin temple for cowboys? Located in Phoenix, Arizona, the SCARS Institute of Combat Sciences includes a two-story "environment room", a weight room, a matted grappling room and various classrooms and offices. The Institute is a spec ops boutique which normally deals with armed forces, military and para-military professionals, the security staff of international corporations and, once, even a South American billionaire and his bodyguards. Off the Institute's private parking lot is the outside entrance to a two-story arrangement of office spaces, a kitchenette and two bathrooms. The low-key decor is functionally anonymous. Only the presence of guns and lions suggests that this firm does anything more strenuous than tweak software. However, along the far wall leans a row of dummy assault rifles and faux 9 mm semi-automatic pistols. For realistic training, these industrial-plastic reproductions exactly duplicate the original models' weight and heft. A banner spread across one wall displays the SCARS escutcheon: a naked sword between lions rampant, haloed by the legend: "SCARS Institute of Combat Sciences--Proven In Combat". Part of what this motto means is that SCARS president and Vietnam veteran Jerry Peterson has killed the enemy. More than a few were taken out with his bare hands, including, most terribly, four at once "because there wasn't room to shoot them." Passing through this reception area, the Institute has a connecting room which is paved with over 2,000 sq feet of new Olympic-quality mats. A square space and well-lit, it offers zero hiding places. Campers got to know it very well. There's a blackboard here for the occasional brief chalk talk. Across the mat room, the door wall displays medical-quality anatomy charts which locate nerves on the back and front of the adult male body. Around the next corner, these charts are made tangible by three custom Peterson Attack Trainers. PATS are SCARS' own line of practice dummies: life-size canvas gingerbread men dotted from head-to-foot with colored striking points. Finally, a yellow and red Igloo water barrel sits on a shelf strewn with plastic cups and extra-large bottles of several kinds of over-the-counter pain-killers. For me, this snapshot image, captioned "Thirsty and Hurting", sums up the basic SCARS training experience. On these mats, for the next four days, the campers spent eleven hours of their nonstop fourteen-hour days. Three hours daily were given over to one-hour catered cafeteria-style breakfasts, lunches and dinners. We ate together at long communal tables set up out in the reception area. And, unlike Elvis, we never left the building. The space beyond the mat room is a two-story 10,000 sq. ft. "environment" room where mission-specific installations are built to suit the training requirements of whatever contract is currently being serviced at the SCARS Institute. Recently, when the Arizona State Police needed an in-door repelling tower complete with water hazard and white sand beach, SCARS put them in. We campers never got into the "environment" room. However, its very existence powerfully underscored one humbling fact. Training the occasional handful of civilian amateurs is not really what this Institute is all about. If you are only used to studying with teachers whose qualifications center around having won a lot of plastic trophies, you begin to feel the difference in authority, immediately. Heavily. The SCARS Institute feels serious. This place is not a martial arts school. It does not teach sports or sportsmanship. Most of the people who train here are paid professionals of covert violence who are about to go in harms way. The basic staff consists of Jerry Peterson, an ex-SEAL named Tim Larkin, Peterson's talented son Blake, plus a rotating personnel of hand-picked "operators" proficient in various specialities who are brought in on an as-needed basis. During breakfast on the first morning of the camp, without any fanfare, Jerry Peterson appeared among us. I examined him carefully, reminding myself: "This guy makes a seven-figure living by walking into roomfuls of bloody-minded security experts and proving to them, in front of their superiors, that they don't know squat about their own metiers (occupation)." Something only a genius could get away with, much less make money at. In person, California-born Peterson is a tanned, trim man of medium height who projects easy-going candor. A youthful forty-something, Peterson looks like a morphing of three cinematic icons of no-sweat masculinity - Kris Kristofferson, John Voight and Nick Nolte, depending on which angle of his face you see. Jerry L. Peterson is the founder and sole developer of the SCDARS program for the Navy Seals. Jerry Peterson is a decorated Vietnam-era Army veteran of "C" for Charlie Company of the famed 173rd. The 173rd took the brunt of the fighting during the 1968 Tet Offensive. Peterson survived what military historians concede was among the harshest combat of that ugly war. His unit's job was to go into hot zones and pull out other troops in trouble. In recent years, Jerry Peterson has done extensive contract work for various units under the U.S. Special Operations Command, which controls the Army, Navy and Air Force special-operations forces. He has been employed by the Department of Energy's critical-materials transport people, various Drug Enforcement Agency counter-narcotics units, and the Department of Treasury's U.S. Secret Service members. This is documented by the numerous thank-you plaques that hang on the Institute's walls. Other government and federal units have also been trained by Peterson, but SCARS will neither confirm nor deny anything. And that makes sense, because before anyone can train such groups he has to sign a pile of documents saying that he'll never say he trained them. And that's just Peterson's Washington resume. Currently, a small infamous Eastern European nation wants him to revamp their entire military. Meanwhile, back in Hollywood, a SCARS TV show has been scripted and cast and only awaits the green light. The "Today Show" keeps calling up, too. Jerry Peterson's second-in-command is a fellow-Californian named Tim Larkin, a big, thirtyish ex-SEAL who looks like he ought to play rugby. As a combat trainer, having a body-builder's physique lends him instant credibility. It doesn't hurt the corporate image, either, that Larkin sports a gallant scar on one cheek--souvenir from a demolition exercise screw-up--which would have been the envy of any 19th century German fencing master. Blake Peterson and Tim Larkin demonstrate the type of dynamic ground fighting taught in the SCARS system. 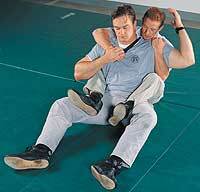 The hold shown simultaneously attacks the opponent's neck an shoulder. On Day One, Larkin introduced himself and passed around spiral-bound copies of "Manual #1 Hand To Hand Combat For United States Operations Forces Army/Navy/Air Force". Every single page of course material is slashed diagonally with "Restricted Copy Property of SCARS Institute". The meat of this text consists of twenty-five Combat Lessons. Each of these Lessons is a sequence of four or five techniques, usually including a throw, which are initiated off an opponent's punch or kick. These sequences contain no defensive moves whatsoever. Instead, all checks to attacking arms or legs are delivered as intercepting counterstrikes aimed at specific nerves. Whenever Jerry Peterson taught us, he wore a wireless microphone. A staff video cameraman followed him around, taping every move. On this first morning, Peterson gathered us in the mat room. He began by outlining the value of what SCARS calls "the offensive mindset". "This is why defensive fighting systems cannot win against SCARS," he told us. Diagrams on the blackboard indicated that direct offensive action is always quicker through the nervous system than the stop-and-catch-up reactions of a defender. "SCARS is literally faster than any other kind of fighting." Then, to demonstrate, Tim Larkin or his son Blake would attack Peterson. 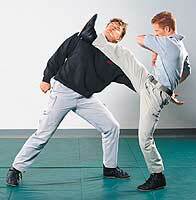 And what does the best-paid self defense teacher on Earth look like in action? Plain and simple. Peterson moves like a younger man demonstrating unhurried economy of motion. His "colorless" efficiency spares students that pang of dismay most of us feel when asked to duplicate a flashy self defense technique. Today so many black belts who aspire to big paydays cultivate a blinding athleticism which, in truth, has little or nothing to do with successful self defense. But, from the git-go, SCARS instructors make you confident of being able to duplicate their every move. SCARS teaches participants the proper way to use close kicks. to illustrate, Blake Peterson uses his shin to strike his opponent's throat. What is the thrust of the training? Is there a "secret" to SCARS? Yes. It is a core concept which Peterson calls "Autokinematics". Briefly put, he has spent twenty-plus years researching the effects of shocking force on every vulnerable nerve, bone and organ in the human body. Not just the various injuries which can result but precisely how the entire body will react at the instant of being struck. What is ground-breaking--Peterson's flash of Eureka!--comes from grasping the combat implications of one simple physiological fact: When it comes to absorbing punishment, every human body always reacts exactly the same way. So, from its first blow, SCARS attacks the autonomous nervous system, which controls such "instinctive" behavior as pulling fingers out of fires, lifting bare feet off of sharp sea shells and everything else people do which gets done before we can stop ourselves from doing it. By knowing in advance, in detail, what reactions the enemy will be unable to suppress--and, therefore, which targets his recoiling body will next expose to attack--a SCARS fighter can seize control of his opponent and work the man like a pain puppet. SCARS puts the enemy through a non-stop series of traumas which will increasingly incapacitate or, ultimately, kill him. Peterson refers to this as "a rhythmic cascade of harm." What is truly unprecedented is how complete, detailed and scientifically absolute is Peterson's grisly research. Since it is proprietary information, it's difficult to cite examples of SCARS. However, to give the smallest sample, suppose you poke somebody in the eye. SCARS can tell you, absolutely, not only how his head and torso will instantly and involuntarily react, but also exactly where he will move both hands and one of his two legs. SCARS extends this sort of merciless insight over every single inch of your body. This leads, among other things, to a whole genre of combat techniques which are new to most martial artists. For example, I had never appreciated the variety and lethal effectiveness of "compression" attacks before taking this camp. One such killset involves, first, making your opponent throw up by twice striking a certain nerve plexus and then insuring, by a brutal compression, that, while gasping for the air he can no longer get, the man breathes in only his own hot vomit. Chalk talks were few and far between at the Work Up Camp. Almost always, we were paired-off and practicing Combat Lessons at half-speed. SCARS is so fast, you practice it slowly. In conventional two-man self defense sets, the opponent attacks, gets blocked and then stands around straight-faced while his partner follows up with multiple high-speed blows. SCARS partners, on the contrary, must learn to precisely mimic the Autokinematic reaction caused by striking any given body part. We don't just stand there; we flinch, fold, lurch or fly, depending on how a real-world opponent would actually react. Total immersion in the course material is the SCARS teaching method. The focus of training is not so much on committing sequences of moves to memory. SCARS is about learning to fluently, ceaselessly attack body "targets": the vulnerable nerves, bones and organs. And in the learning process--make no mistake!--you are expected to get a little banged up, for your own good. Working through the 25 basic Combat lessons took three days of remorseless practice. We were not permitted to buddy up for long, so every set of techniques was tried out over and over again on every one of the thirty-odd campers. Since most Lessons also contain a throw, everybody was hitting the mat endlessly. By the second day, we were doing it by the numbers and the pace got even brisker. Over the long 40-hour haul, not being able to handle getting repeatedly thrown seemed to account for most of the problems campers experienced. Another difficulty, foreseeably, was guys accidentally eating a technique. One camper took a heart shot and proceeded to demonstrate the precise Autokinematic reaction we had been taught to expect. The incandescent pain only abated, but never ended for this camper. It kept him awake at nights so that he couldn't sleep. Nonetheless, he completed the course. Peterson's training style is reasonably grueling. One camper thought he broke a rib. Peterson said: "Hold your arms over your head." Wincing, the camper did so. Peterson slapped his flanks hard with both hands. The camper went white-faced with pain. "No," Peterson continued affably, "you're okay. If any ribs were broken, you'd be on the floor by now." To change the pace, our long training days were broken up by supplementary drills. One involved putting on so-called "flak jackets". Then we proceeded to drive our partners backwards the length of the room, using full-force fist, elbow and palm strikes to the torso. At the far wall, partners would then exchange the jacket, and the beatee became the beator. Our SWAT team leader hit so hard, Peterson finally asked him to pull his punches. And that nice Indian fellow fetched me a sternum shot that I could still feel on Christmas morning. Later, after trying out all our upper-body weapons, we went on to further explore various ways of kicking each other to and fro. When asked why we performed this exercise, Peterson spoke of "learning the Autokinematics." But, I think, a large part of it also has to do with his strong conviction that a fighting course in which no one gets banged up is a phony. "You have to learn how to take shots," he remarked later. The training peaked in intensity on Saturday night. After another long sweaty day of grinding it out, we were by-God told to stop acting like a bunch of sissies and start really trying to hit our training partners. By now, if somebody wasn't deft enough to stop an attack--well, tough dart, as the Brits say. We got into doing line drills in which you kept personally creaming the entire class. Every student free-styled with everyone else over and over again. By now, a few guys had opted out and were standing around the walls just watching. But the rest of us were going through a roomful of fighters single-handed and never once repeating a sequence of moves. We had achieved impressive combat efficiency. Overall, the curriculum also turned out to be more varied than I had expected. During the 40 hours, we practiced hand-to-weapon attacks, using padded clubs and knives. Then we went on to study disarms of rifles and semi-automatic pistols. The same basic SCARS moves and principles always carried over seamlessly to all these ancillary exercises. At another point, Peterson discussed Brazilian arts and demonstrated how SCARS treats grapplers. Some wrestlers among us put him into so-called "inescapable death holds" and he always broke free within two or three seconds. As always, too, each camper was immediately capable of doing exactly what Peterson had done. Bland as this may sound, it is what trainers are paid to do and rarely achieve so well. After being challenged by one camper, Peterson duplicated a stunt made famous by his magazine ads. Thirty of us could not pin him against a cinderblock wall. A minute later--having seen him do it once--each of us was making Peterson's escape work for us. Peterson is able to do all these "miraculous" things because he is applying universal physical principles to specific situations, not just remembering moves shown to him by somebody else. The significance of this cannot be over-estimated. It means that SCARS is alive and still evolving. The camp's emotional climax came after our last lunch together. We all sat around the long tables, applauding the other guy for having made it through. Peterson and his staff handed out handshakes and certificates which cited "extreme training conditions including extensive physical hardship." We were named "qualified SCARS Training Partners". Instead of a handshake, our Indian partner insisted on hugging Peterson--to great laughter and applause. The rest of Sunday was largely given over to a seminar on how to deal with carjackers. Garage-size doors were opened, the mats peeled back and a sweet-looking cherry-red pickup was driven inside. We were told that these teachings have already saved real-world lives among SCARS adepts. But tomorrow was another manic Monday; and various guys had various planes to catch. One by one, the campers began peeling out of formation and heading home to nurse their bruises. And me? In forty hours, everything I thought I knew about unarmed combat got turned on its head. I found out that the Navy SEAL fighting system is simple and groundbreakingly complete, easy to learn and yet unanswerable. I have seen the future of self defense, and it is SCARS. Herb Borkland is a nationally known writer and journalist who has extensive experience in both Korean and Chinese martial arts. He is a former Associate Editor of Martial Arts Illustrated and Contributing Editor to Black Belt magazine. In 1977 he was named Inside Kung Fu's (Hall of Fame) "Writer of the Year." He is also the producer and on-air host of the national martial arts weekly TV program "Black Belts." He also serves as advisor to FightingArts.com and several Chinese national martial arts organizations.